Which Viral Meme Of 2015 Best Sums Up Your Year? You can only ever look at one of these internet cats ever again. Which one is it going to be? Which of these OTPs would you most like to happen in 2016? What is your understanding of Netflix and chill? The Scandal boxset and a onesie. Out of the following, who are you most thankful for in 2015? Which of these best sums up how your year went? Which type of Instagram photo are you most guilty of posting in 2015? Discovering how to use the search function on tumblr. Harry Styles' attempt to bring floral flares back. Twitter changing favourites to likes. Completing the Kylie Jenner lip challenge with no permanent damage. Weirdly it was something that happened in real life and not on the internet. Who are you predicting Taylor Swift will welcome to the stage in 2016? You believed in your dreams when the odds were against you and hey, not only did you achieve them, but you also got a piece of pizza bigger than your entire body out of it. Well aren't you a controversial character? This year life was confusing and you split people's opinions right down the middle, but yolo and all that. You overcame the odds and won the hearts of the nation. Well done you. Sometimes things didn't go to plan this year, but ultimately you did your own thing and it paid off. Dad dancers from across the world will forever consider you a hero. Your year was sassy af, wasn't it? First things first you're the realest thing that happened to 2015 in, well, 2015. Nice one. 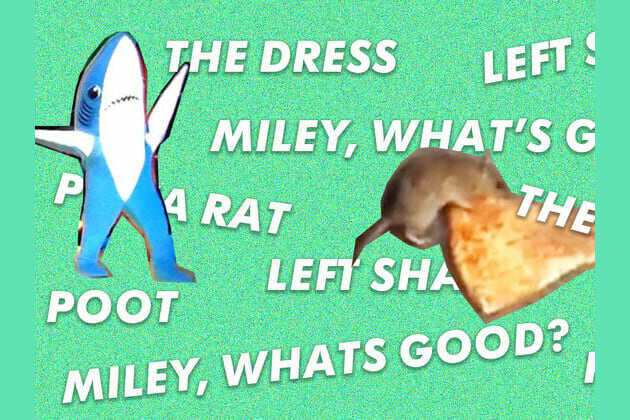 Are you more Pizza Rat or Poot?